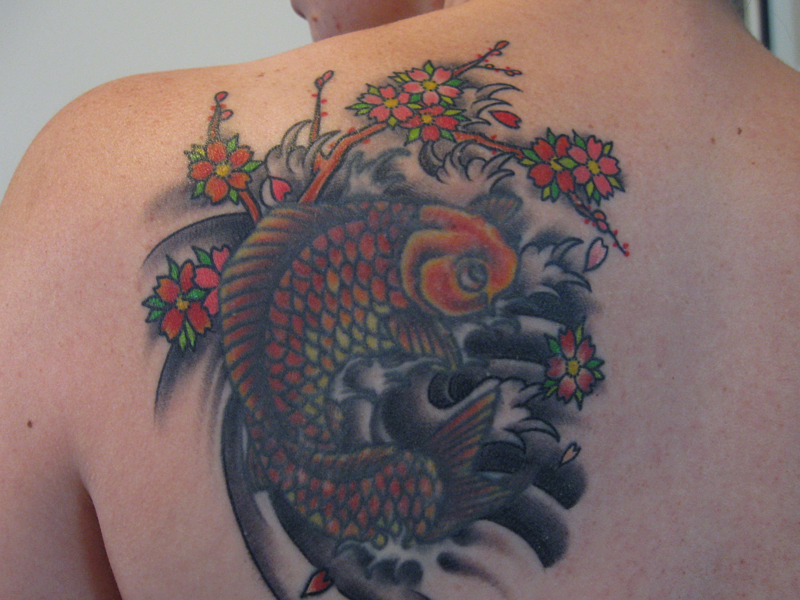 The koi fish part is almost six years old now, and the cherry blossoms are the new addition. I'm not sure why I waited so long to add on to the fish, as it was always my intention to do so... I suppose I just wasn't sure which direction to take it; I had contemplated lotus flowers originally but I'm really happy to have gone with cherry blossoms instead. On another note, I thought the fish was looking pretty good for as old as it is... until I got the flowers added. The difference in the crispness of the lines is astounding! I should have gotten the fish touched up while I was there, but I didn't realize how faded it was going to look in comparison. But I don't know how much more time I could have spent on that table... this definitely hurt way more the second time around than the first. Chalk it up to me getting older, I suppose. 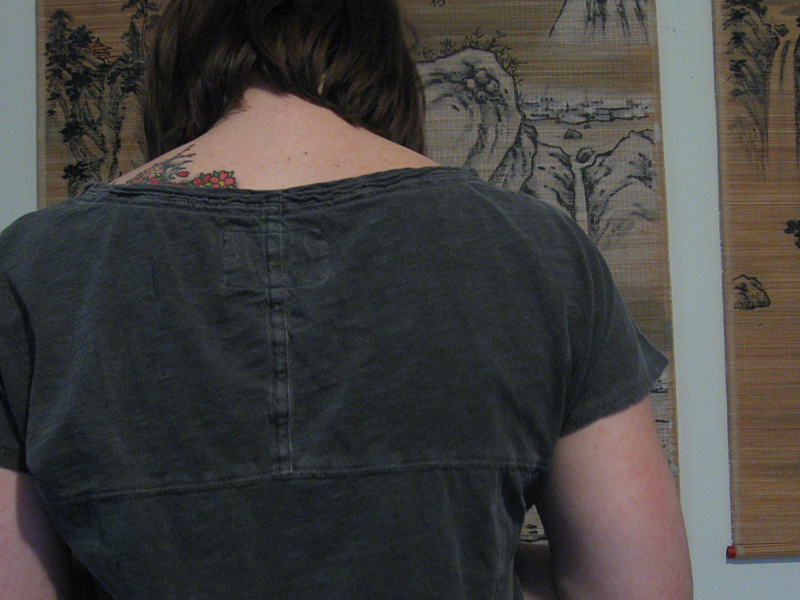 Also, my absolute favorite part of the tattoo is how it delicately peeks out from most of my necklines now. I've never been flashy about my tattoo, hence why it's placed where it is, but I couldn't really see the fish myself without a mirror. Now I'm able to catch a glimpse of blossoms by just peering over my shoulder! Fellow tattooed folk - did it hurt a lot more the subsequent times for you as well? It looks great! 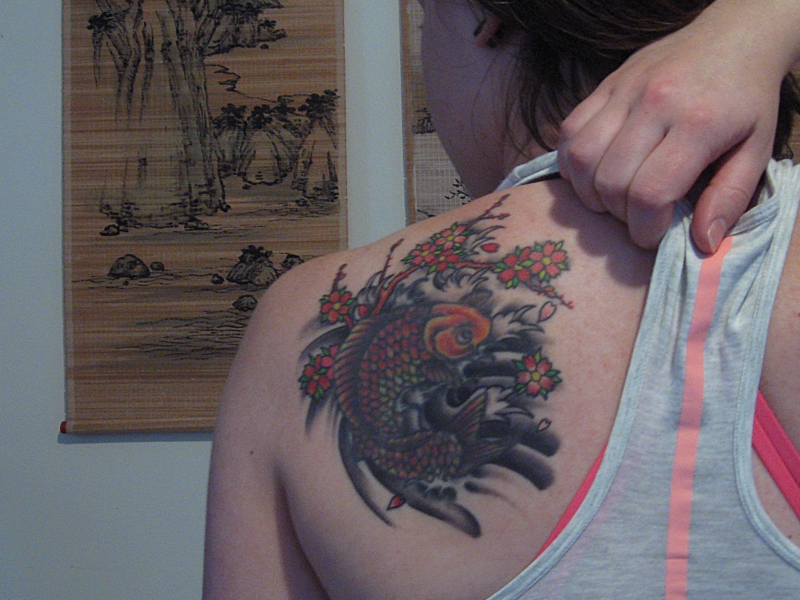 I wish I could attach a picture of the koi fish and cherry blossoms on my shoulder (its on the same side and with similar colors too). Though I got mines all at once, the tattoos on my thighs hurt the same as my shoulder, if not less. Aw yeah, I'd love to see it! I've heard that the shoulder is a particularly sensitive area, so I guess it's a good thing I got that out of the way because I won't be getting any more there!